"Sampath Speaking" - the thoughts of an Insurer from Thiruvallikkeni: the 'Arunachala' Kiwi .... what ? March has just ended – Chennai is already hot – experts are predicting gruelling summer and oppressive heat. as you travel, at home and in workplace too… it is also the time when there will be inundation of advertisements of sugary drinks and energy drinks ~ you will find favourite sports persons and cine-actors, actresses actively promoting various brands targetting children. As the mercury shoots up, people start predicting that ‘this year summer is going to be more hot’ …. Every magazine you will find health advisories – advocating intake of more liquids, more fruits, more juices and more ....perhaps, the easily available ‘buttermilk and lemon’ would do more good. Medics will advise on possible infections and ill-effects of juices made with poor quality water and ice. Summer also is the time of delicious mango season. Mango is a fruit that has enriched literature. So many stories, real as well as apocryphal, are associated with this sublime fruit. Like cricket among all sports, mango among all fruits has lent itself to the folklore of Indian and sub-continental literature. Gone are the days, when only butter milk or traditional sweetlime, lime, mango, orange, grape juices were available. Now there is so much of variety that one flounders in making the selection. It's not just the gadget market that is flooded with imports. With advanced technology, improved preservation, improved transportation, better marketing - the fruit basket is increasingly acquiring a foreign presence. You walk into any smaller shop aspiring to resemble a super-market, you find many fruits - names, taste and quality of some – not known to us thus far !! Apples dominate the fruit imports, followed by pears, oranges, lychees, peaches, kiwi, gooseberries, strawberries, butter fruit (avocado), durian, dragon fruits and more. Even in bananas, there are so many varieties – and so many fruits which were only available at select places like Mangusthan, Manoranjitham, rambutan, paneer fruit are also available. The import of fruits has nothing to do with taste or customer preference. It is packing, transportation and marketing that ensures that the fruits are made available and sold even during their off-season. Then there are the packaged juices which sometimes openly confess of not containing ‘fruit juice or fruit pulp’yet sell hot ! Among the foreign ones, I am fond of ‘kiwi’ – the fruit somewhat sour in taste. It comes from New Zealand – the island Nation in the southwestern Pacific Ocean. The country geographically comprises two main landmasses – that of the North Island, and the South Island,– and numerous smaller islands. It is also known as the ‘kiwiland’ .. .. .. the ‘kiwifruit’ the edible berry of a woodyvine in the genus Actinidia. Some articles suggest that this fruit helps preventing asthma, obesity, colon cancer, heart disease and protect our DNA from mutations. Reportedly, kiwi fruit contain more vitamin C than oranges, as much potassium as bananas and high amounts of beta carotene. Kiwi fruit is high in fiber which aids in controlling blood sugar levels and lowering cholesterol. Everybody talks about the way the country’s depressed agriculture sector, the main source of income for 40 per cent of our population, has been pulling down our growth figures.But does anyone really care about what our farmers have to offer and how our traditional crops can be turned into money-spinners with some intelligent marketing? ~ here is some interesting piece of information from MailOnline. 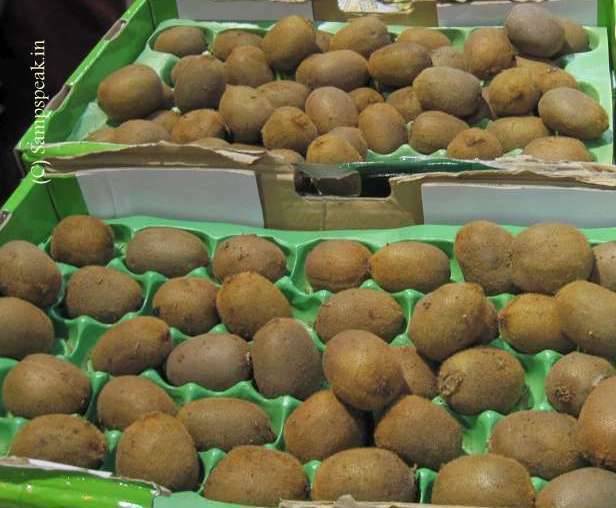 Kiwis from Arunachal Pradesh are 30 per cent cheaper, yet they’re sold in Delhi with foreign labels and at prices commanded by the imported fruit so that people buy them. There are some who shunned Wall street and IT field, entering the domain of farming. Puneet (who had been developing technology solutions for Wall Street) and Ishira (who was with the International Finance Corporation after after a stint with NGO Self Employed Women’s Association) launched CropConnect with the purpose of discovering hidden gems in our fields and getting them onto the table.It is a very different startup in a market driven mainly by the urban hunger for a better lifestyle. To set it up, the pair criss-crossed India - across 70,000 kilometres - to contact farmers and see for themselves what’s pulling the sector back. Of all the stories they shared with me, I found the one about kiwis grown in Arunachal Pradesh most telling. India imports 4,000 tonnes of kiwis from New Zealand, Italy and Chile - the most favoured brand name being Zespry - but those grown in Arunachal Pradesh sell for 30 per cent lower than the price commanded by the multinational.Over the last three years, Puneet and Ishira have seen Arunachal’s kiwis struggle to gain a toehold in the national market; ironically, there are no takers if they’re identified as locally sourced and cheaper to boot.What is more worrying is that many of the traditional crops, some with healing properties, are getting lost forever. Fruit wholesalers therefore have hit upon a novel idea, as Puneet and Ishita have discovered, to clear domestic kiwi stock and make more money. They sell them under a foreign label at prices commanded by the imported fruit. Well, the market subterfuge does ensure their stocks don’t remain unsold, but do they benefit from the higher prices their produce now commands? No way! The north-east especially, Puneet and Ishira have discovered as they go about 'mapping the gap between the consumer and the producer', is a treasure trove of products that deserve to be better known in the rest of the country. These include Nagaland’s pineapples, Meghalaya’s ginger and turmeric, Manipur black rice and passion fruit, and the badielaichi from Arunachal and Sikkim. What is more worrying is that many of the traditional crops, some with healing properties, are getting lost forever. These include Karnataka’s ‘Diana’ rice, which has been found to be beneficial for diabetics. And then there are products just waiting to be discovered, such as jamun powder from Jharkhand (again, beneficial for diabetics); bajra whole wheat biscuits from Jhajjar (Haryana) and bamboo ‘rice’ from the seeds of bamboo blossoms growing in Karnataka.There's also jhangora or barnyard millet, from Uttarakhand, which is now being hailed as an alternative to quinoa (for which production cannot match the worldwide demand); and another hugely beneficial product from the hill state - nettle tea. That's not all. Many of the local products can be sexed up for the urban palate, such as the vinaigrette developed from the ubiquitous rhododendron flowers growing in Uttarakhand, or the rock salt flavoured with bhangjeera seeds.And then there's the white munsiari kidney beans (rajma), which are accompanied by a sachet of the herb named gandrayani, which reduces the possibility of flatulence resulting from intake of the beans.These diverse ingredients, sourced from 10 farmers’ groups from across India, find a place in the Original Indian Table boxes that Puneet and Ishita are test-marketing via their online store, www.originalindiantable.com.These are baby steps that they hope will lead to the creation of an FMCG brand dedicated to the traditional produce of India- neatly packaged and intelligently marketed. It’s a commendable and creative initiative, but one is not good enough. Indian farmers need many more CropConnects to enable them to enter the marketplace without middlemen getting into the picture. Let the free market work in their favour too.